‘She Has Nerves of Steel.’ People Are Praising the Pilot Who Landed the Southwest Flight. 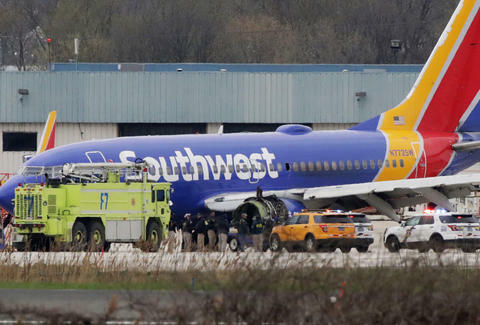 In the aftermath of the Southwest Airlines engine failure and emergency landing on Tuesday, which left one woman dead and seven others injured, passengers from the flight and many others are praising the pilot who managed to land the aircraft safely at Philadelphia International Airport. Tammie Jo Shults was one of the pilots on Flight 1380, which departed New York's LaGuardia Airport for Dallas Love on Tuesday morning carrying 149 people. About 20 minutes into the flight, the plane's left engine failed, sending shrapnel into one of the aircraft's windows and shattering it while the plane sailed at 32,500 feet. A woman sitting next to the window was partially "sucked out," with the top half of her torso hanging in the open air, The New York Times reported. Passengers rushed to her aid, spending several minutes pulling her away from the hole, until she was brought back into the cabin. Max Kraidelman, a passenger onboard the flight, said: "The top half of her torso was out the window. There was a lot of blood because she was hit by some of the shrapnel coming off the engine after it exploded." The woman, who later died on Tuesday, was identified as Jennifer Riordan, a 43-year-old community relations leader and mother of two from Albequerque, New Mexico, according to CNN. Her death is the first in the history of Southwest Airlines and the first in American commercial airline travel since 2009, according to National Transportation Safety Board chairman Robert Sumwalt. Amid the chaos, Shults landed the plane safely in Philadelphia at 11:20 am. Her feat of landing a severely damaged aircraft without further incident is being hailed as a triumph. Shults is one of the first female U.S. Navy fighter pilots in history, and of the first pilots to fly the F/A 18 jet. She's 56-years-old, hails from Albuquerque, and reportedly walked up and down the aisle of the aircraft after the landing to make sure passengers were OK. In an interview with CNN affiliate WPVI, Alfred Tumlinson, a passenger on the Southwest flight, commended the pilot for maintaining calm. "Passengers commended one of the pilots, Tammie Jo Shults, for her cool-headed handling of the emergency. She walked through the aisle and talked with passengers to make sure they were OK after the plane touched down." Mind blowing. What a level-headed and we’ll-trained pilot. Good job on her! In an audio recording of Shult's dispatch to air traffic controllers obtained by Mashable, the pilot is calm and collected as she informs ground control that she's flying a plane with one engine. "Yeah, we have a part of the aircraft missing too, we're gonna need to slow down a bit," she says. Shults dispatched paramedics to meet the plane on the runway prior to landing. "Everybody was going crazy, and yelling and screaming," Martinez said. "As the plane is going down, I am literally purchasing internet just so I can get some kind of communication to the outside world." Martinez uploaded videos of the cabin to Facebook, and even managed to livestream a grainy video of the scene. He later uploaded photos of the damaged aircraft to Facebook. "I didn't know if we were going to be running into a building. I didn't know what state the plane or even the pilot was in, if we were in condition to land," he said. "Finally when we ... came to a halt, of course, the entire crowd was (in) tears and people crying and we were just thankful to be alive." According to an early investigation from the NTSB, one of the engine's 24 fan blades was missing. NTSB Chairman Robert Sumwalt told CNN that there was evidence of blade fatigue in the engine, and that since the evidence was internal, it could have been missed by aircraft inspectors on the ground prior to takeoff. The engine was a CFM56-7B turbofan engine, which is widely used in commercial air travel. "In aviation, there should be inspection techniques and procedures in place to detect something like that," Sumwalt said. "What we want to find out is why was this not detected ahead of time." The NTSB, which released photos of the damaged engine on Tuesday evening, is conducting an extensive investigation that will conclude in 12 to 15 months, the agency said. "We are deeply saddened to confirm that there is one fatality resulting from this accident. The entire Southwest Airlines Family is devastated and extends its deepest, heartfelt sympathy to the Customers, employees, family members and loved ones affected by this tragic event. We have activated our emergency response team and are deploying every resource to support those affected by this tragedy." "Southwest Airlines today has announced that it is accelerating its existing engine inspection program relating to the CFM56 engine family. The accelerated inspections are being performed out of an abundance of caution and are expected to be completed over the next 30 days. The accelerated checks are ultrasonic inspections of fan blades of the CFM56 engines."